Plot wise, this wasn’t my favorite Lady Trent book. I found it to be much slower than the previous books, with lower octane surprises. But when it came to teasing, to sly references of what was right around the corner, to making me question everything these characters were talking about, Voyage of the Basilisk leaves the first two novels in the series in the dust. There are some huge political things going on that Isabella keeps telling herself she’s not involved with (which again, it makes me want to read The English Patient). There is war on the horizon, new technologies, governments destroying their rare and natural resources for political gain. Far more happening off the page, rather than on. I wish there was more happening on page. But I’m sure in the next book, everything will come crashing together. And Suhail, the archeologist? Who is he? He’s obviously more than just an archeologist, but he’s not talking, and Isabella is too polite (or preoccupied) to know. I really loved the conversations between Suhail and Isabella. He’s on the verge of discovering something that could change everything, so I do hope we meet him again in future novels. Isabella keeps referring to untrue things that were published about her. I want to know what those things were! See what I mean about the teasing? plot and character wise, Basilisk did not knock my socks off. But I want my questions answered, and know Brennan’s answers most certainly will knock my socks off. Interesting side note on book design – in the first two books, the print inside is brown. In Basilisk, the print inside is blue. Of course, I am curious about this color decision! In the first two books, Isabella spends most of her time on land (and sometimes in a swamp). In the third book, she is mostly in a ship on the ocean. Two books on land get brown print. the book on the sea gets blue print. Not sure if that’s the why behind the what, but that’s my guess and I’m sticking with it. 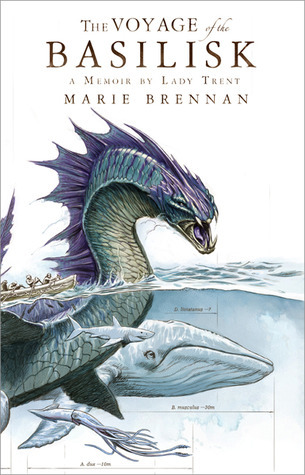 7 Responses to "Voyage of the Basilisk, by Marie Brennan"
I love this series so much. It’s so unlike anything else I’ve ever read, and I love the scientific approach to what we generally class in fantasy as, well, the fantastic. Something that doesn’t need explaining. A dragon is a dragon, so who cares how it flies or breathes fire? It was great to find a series that looks at such things in a scientific way, and makes an amazing story out of the discovery. 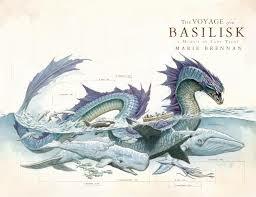 I’ll go against the tide here and say I liked Basilisk best of the three. For me the story went faster, the shipboard sections were fascinating, the islands setting of the last part I loved. The new character left, but I’m sure we haven’t heard the last of him, or I hope not. And I mean, come on, riding sea serpents? Yeah. I’m already eager for the next book, and I guess it’s a year away, though I think the cover art is already out. Riding the sea serpents was freakin’ awesome! Waiting on a price drop before I pick this up! 😀 I quite enjoyed the first two books, the second in particular. It was relaxing to meander around the setting, to the tune of Isabella’s narration.